Ornamental grasses give a landscape an updated look–landscapers started incorporating them 20 or so years ago. 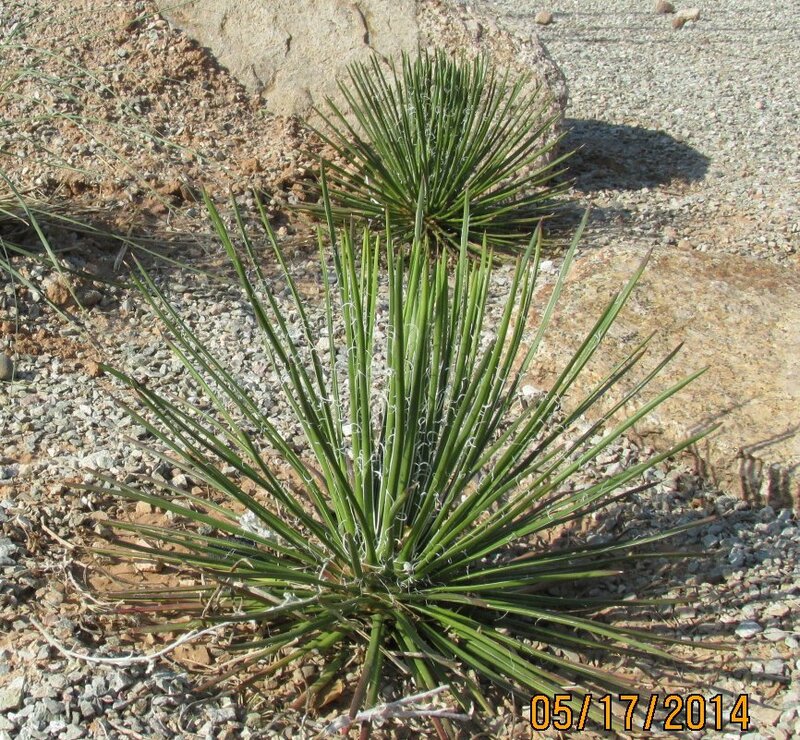 In Arizona, there are a large variety of plants that have a similar silhouette to ornamental grasses. Add them among your other bushes and cacti to give a filled out look. While ornamental grasses use less water than lawns, you may want some grass-like options with even lower water requirements. Or you may be going for the look of a lawn with lower water requirements. Latest trends for the desert are to use lawn alternatives. You can try a groundcover, grow a lawn using meadow grasses, or put in artificial turf. Here are my plant suggestions. 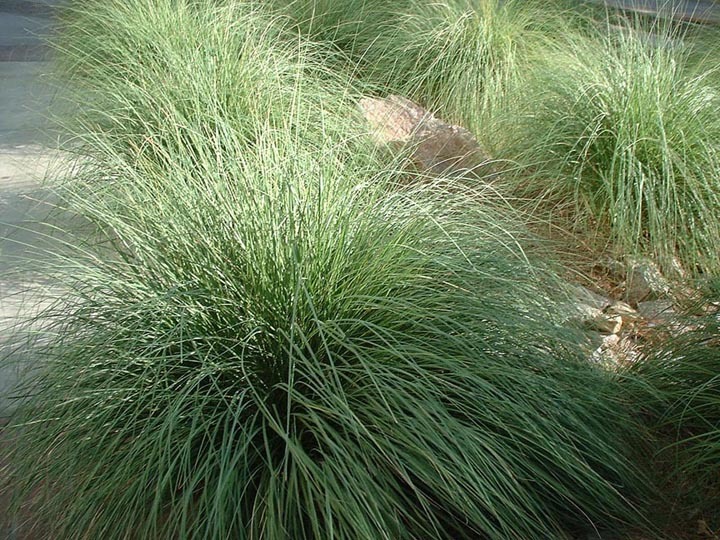 This native grass is rabbit resistant, and can live on only 15 inches of water per year. Can tolerate drought when established as well as regular water. Prefers sun but can grow in shade. Reaches up to 5 feet tall and 5 feet wide. 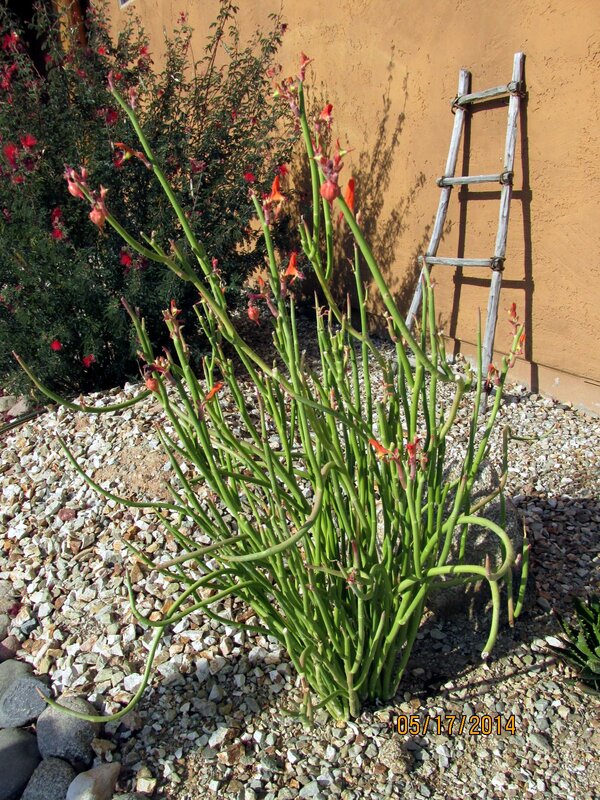 Great xeriscape native plant choice for Arizona. 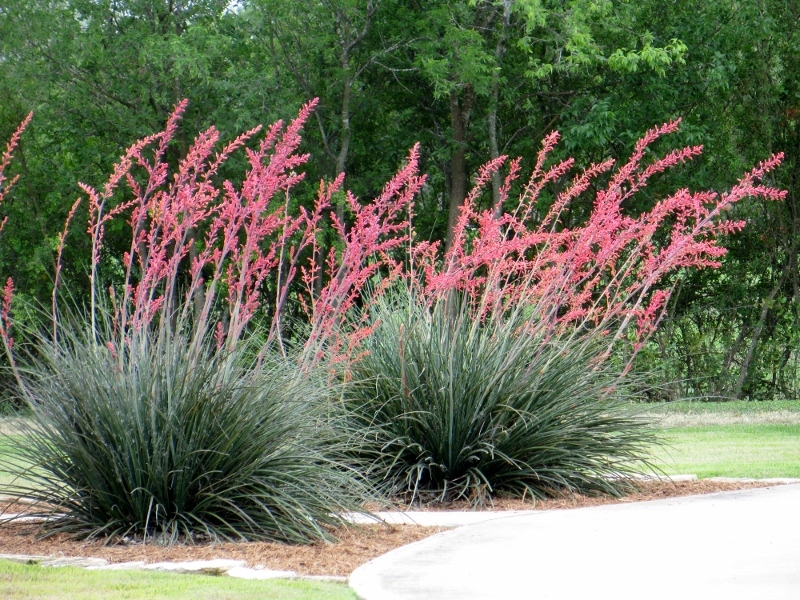 Showier and smaller than deer grass, pink muhly grass grows 3 feet tall by 3 feet wide. Fluffy pink–colored flowers dry to a light buff. The plant looks great when backlit by the sun. This grass is also native to the southwest. Water every one or two weeks. 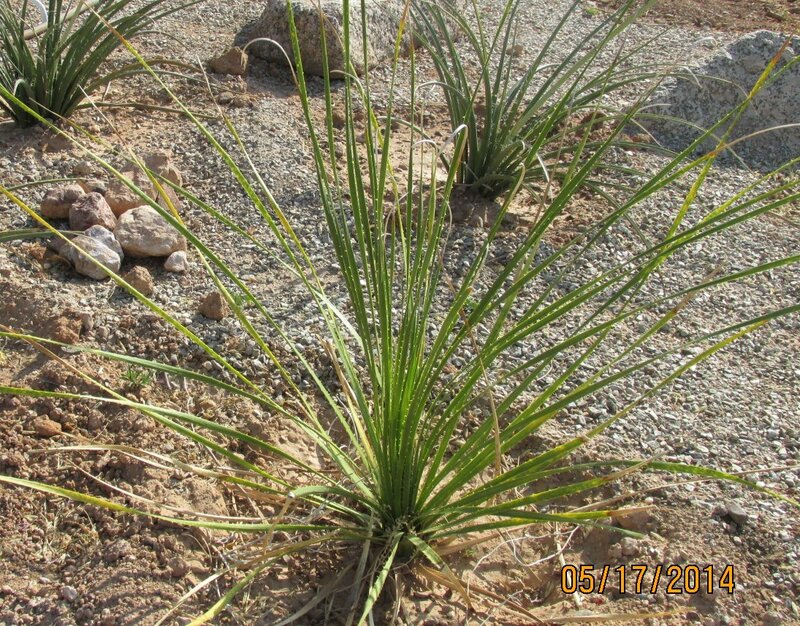 An Arizona native, this grass reaches 4 feet by 4 feet and requires moderate water (weekly). This feathery ornamental grass forms small clumps. Airy seed heads move with the wind and create interest in smaller spaces. Grows 18 inches tall and wide. Water every 2-3 weeks when established. This fast growing grass reaches 18 inches tall and wide and requires weekly water. It is native to the Chihuahuan desert. I like the feathery look. A bunch grass from across North and South America that grows 18 inches by 2 feet. Water every 1-2 weeks. The seed heads stick out to the side of the grass blade. I love this plant. Not a grass at all but looks just like one. I haven’t seen it commonly in nurseries, but I see it while hiking in Prescott. Grows 4 feet high and wide. Wispy white flowers in spring and cute curly strands make it unique among plants. Water once or twice per month. This plant is easy to find. The main plant looks like a thick stemmed grass with the bonus of long-blooming flowering stalks through the hot season when other plants are dormant. Red (dark pink) and yellow varieties. Grows 3 feet high by 3 feet wide, clumping. It is not native to Arizona. Water every 1-2 weeks. This spiky spoon and it’s blue-green cousin are easy to find and complement a landscape of native Arizona plants. While not a grass, its profile is similar. Up to 4 feet by 4 feet. Water twice a month. This agave has thin stems that resemble grass. Low water needs, since it is an agave. I did have a bunny nibble mine. Smaller size – 2 to 3 feet tall and wide. Native to Sonora Mexico, this sculptural plant has succulent, lime-green stems that curve as they grow long. The latest rage in modern plantings, it has no thorns and requires little maintenance. Great color to complement other shades of green. Size 3 feet by 3 feet; low water. Best in light shade. Arizona’s climate is hard on a lawn. The soft turf grasses can’t survive the heat of summer, and Bermuda grass feels rough on bare feet and turns brown in winter. A classic lawn in the desert creates a haven for crickets and scorpions. When I moved here, I vowed I would never mow a lawn. With all of the cons, I prefer finding something green that suits the space. If you’re looking for a lawn option without the maintenance, try a groundcover, a meadow lawn, or artificial turf. Native to the Chihuahuan desert, this low ground cover has silvery green leaves and lavender flowers. Approximate size 2 by 6 feet. Water every 2 weeks. A thornless ground cover native to Africa. Many varieties have showy flowers during winter months. Low to moderate water. A popular ground cover with bright green leaves. Short and spreading 8″ by 6 ft. Takes moderate amount of water. This variety of the herb rosemary grows 2 feet by 4 feet and requires water every 1-2 weeks. The trailing branches can look dramatic. I saw some juniper growing in a raised planter in Sedona. The juniper ground cover looked like lawn (from a distance) and created a stunning contrast with the red rock. Requires weekly water. A truly native approach, consider using native grasses to grow a meadow. A meadow is harder to establish, but uses much less water than a traditional lawn. Depending on the type of grass, you may mow or trim only a few times per year. A meadow requires more work to weed, due to the space between plants. Growing a meadow uses grass just like growing a forest uses trees. This fast growing bunch grass is native to North America. It can be grown from seed in the spring. To maintain a lawn, it requires 2-4 inches of water per month during the summer. Best mowed high for grass health (3-4 inches). Looks beautiful allowed to grow to full height with the attractive seed heads. Other meadow grass varieties you may look for: Buffalo grass, Curly Mesquite grass (Arizona native), and Blue Fescue (requires more water). If you want the look of a classic lawn, try artificial. The artificial turfs for sale these days feel so soft, look real, and require little maintenance. Your lawn will always look like a golf course, you never have to mow, and there is minimal weeding. The savings in water alone amaze me. Summer water. Usually only have one flower stalk, and they don’t look happy. Should I plant them min cactus mix instead and water them sometimes? Woud they like compost? Clay soil should be fine. Try watering more often during the heat–once every 1-2 weeks. They flower most when it is warm. Where can you buy ornamental grasses in Phoenix area? Have not been able to find. Would appreciate help. Sorry for not replying sooner–I have not been checking this blog as often. I agree it can be hard to find specific grasses. Most nurseries have deer grass, muhly grass, and a few others. If you want something specific you can try calling in advance. I live far west valley, so I haven’t been able to scope out very many nurseries. So my recommendation is check small local nurseries close to you and move out to farther locations until you find what you are looking for.